Arriving on an early flight, it was refreshing to be through customs, baggage claim, and shuttled to the Deidredamo hotel within 40 minutes of landing (it should be noted that late in the day people joining the party took 3 times longer). Perhaps there are some advantages of visiting a destination the rest of the world is not clambering to visit. After arriving at the hotel we went for a quick local breakfast (only 148Br for three of us), at a place near the museum. Soon I was on my way to the Natural Museum of Ethiopia, to visit some ancestors. 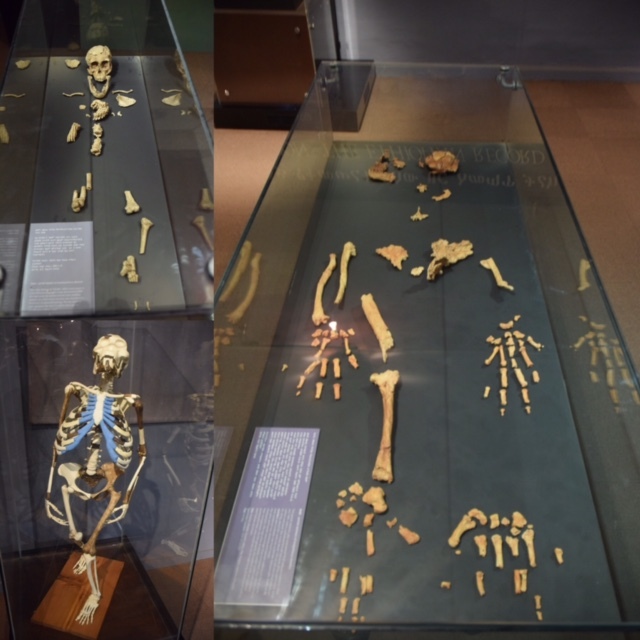 Lucy and Ardi are the oldest hominids with Ardi 4.4 million years old and Lucy 3.2 millions years old. Although only partial skeletons you can see the heritage. Lucy is just over a meter when reconstructed. The museum also had so other mammals and reptiles that have gone extinct, and some early tools. Also on display the migration map of homosapiens, bot to Asia and the rest of Africa (via the rift valley). And that was just the first floor. Then the Abyssian and Ethiopia history exhibits waited, with the cultural exhibit at the top floor, punctuated with the local art. Was great to visit you get a sense of the history. The guides name was Shami and he gave great insight into the exhibits. He is actually a university graduate, and loves guiding. Next we went to the hills above Addis, to see the view. It was a little cloudy so we could not see much, but it gave you an idea about the place. Addis is the largest city on Ethiopia by far. It is the capital with around 8 million inhibitants. The next biggest cities hold less that a million and are in the north and south respectively. I must be the highest capital or something. Then we went to the church of the holy trinity. This was Emperor Halle Sallie’s church and is impressive. Hi is buried there in a tomb with his wife. The church has stain glass windows telling the 5 most important stories of first the old and then the New Testament. The story of the Ark and The Queen of Sheba was told to me. Queen Sheba went to meet King Solomon, to learn from his success of the governing his people. Apparently King Solomon feel head over heals and the lay together in the biblical sense (no pun intended). Queen Sheba returned to Abyssinia and had a boy, Menelik (the first). Once he was 21 he went to meet his Dad who said he was the rightful heir, but Menelik declined, saying his place as with his people. In the meantime the high priest had, had a dream that the temple would be burnt down, and asked Menelik to take the Ark (that was in the temple), he declined. But then he had a vision telling him he must take it. So he took it and that is why it is in Ethiopia today (so they say). Several copies where made and shared with other churches so no one would know which one was the original. It is believe that whoever has the ark cannot be defeated in battle. There is a replica of the Ark at the Church of the Trinity. We left the church and then went to Tomoca. Having been warned, and also having had the coffee ceremony done for me in Cape Town I expected the coffee to be dark roasted. So I suppose I should say I was not sureprised. 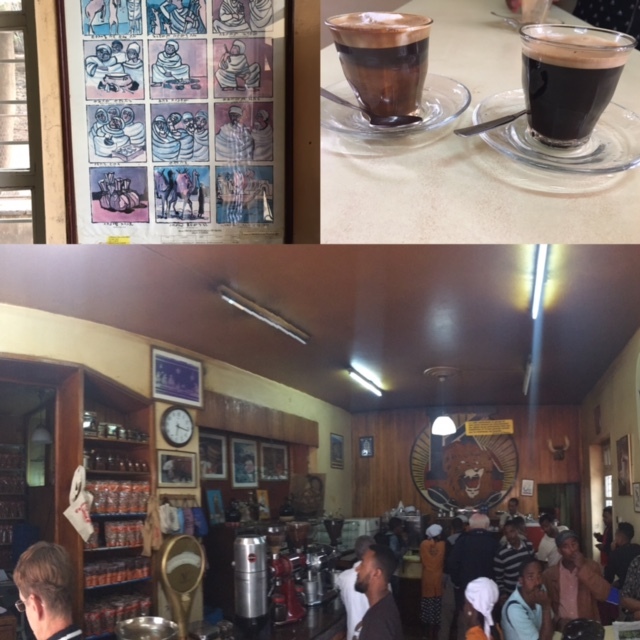 The coffee shop is an original espresso bar, that dates back to the 1920s and it is just that a proper coffee shop. It serves coffee, quickly and dark and bitter. The choice to enjoy for me is either with 1/3 teaspoon sugar or have a macchiato and enjoy the choclotey after taste. Glad I visited the shop was about 30% tourists. I returned to the hotel and went for a walk. I did a 4km loop and found a lot of small trading shops next to four walled low cost living areas (read shacks) that are well hidden from the road, or have cobbled roads going into them, that I did not feel safe to explore. Stopped at a place and had some local bread for 6 Birr (about 4 rand or 25 american cents). It was quite a big bread so shared it with some begging children. The stopped at another little coffee shop. Here I realized what a strong coffee culuture is. People stopping for just coffees and maybe a water drinking a beverage and moving on, like the espresso bars in italy. None really ordering food, just coffee and a quick chat. 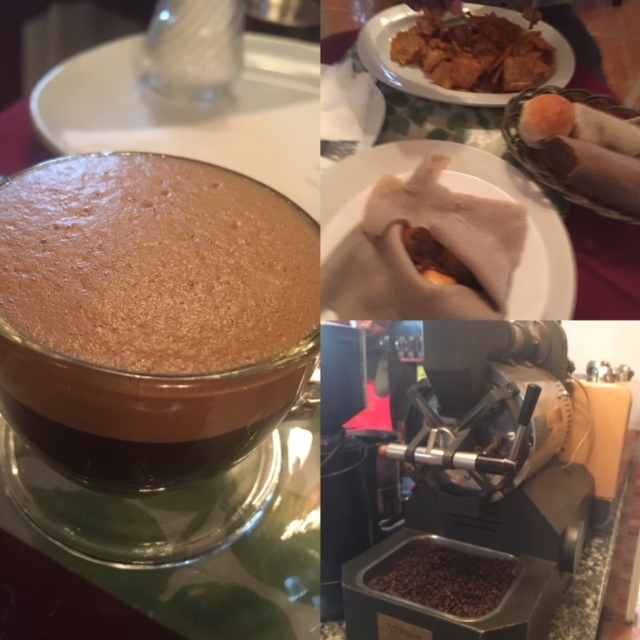 Andrew then arrived and after sharing a cup of TW, we then organized to go to a place that was recommended: Yod Abyssinia. So we took a taxi, and off we went. If you the kind of traveler that is looking for a packaged and presented cultural experience than this is the place to go. It was the first time in the day that tourists outnumbered locals, and not really my thing. Fine the traditional dancing is there and the food is local and the people are nice, but these organized cultural presentations feel put on for me. A bit like the gum boot dancing at Gold reef city, you know it is what they sort of do, but the essence of the reason behind the cultural is lost in the show. And you pay for this. The morning injera and coffee and others things had cost 148 Br, this cost over 600 Br. We returned back to the hotel, got stung for the taxi faire of 500 Br. And waited for Mel, Sarah, Ian and Jonathan to arrive. Sounds like you you had a very full and interesting day. I have enjoyed your news and impressions of your visit to Ethiopia, keep it going….. Ethiopia has always been on my bucket list, can’t ever see me getting there now. All I can hope for is seeing it through your eyes. Thanks Warren.